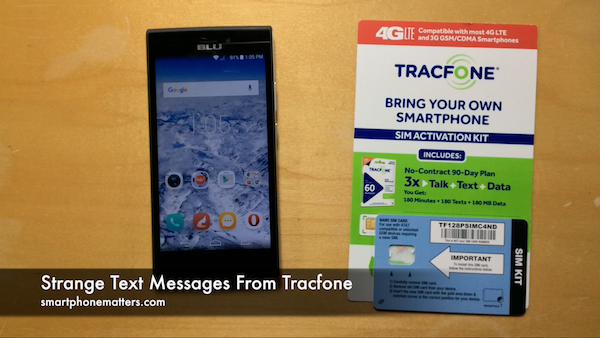 In this video I show you some Strange Text Messages I received from Tracfone Wireless. In my previous video I showed you how to look up the APN settings for your Tracfone smartphone on the Tracfone website. While I was making that video I entered my Tracfone phone number into the website several times. While I was doing this, my BLU Life One 4G LTE Android smartphone with the Tracfone ATT GSM LTE SIM was beeping away. The next day I took a look at the phone and I noticed that I had received a bunch of strange text messages. 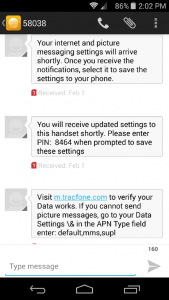 It looks like each time I entered a my phone number and looked up my APN settings, Tracfone sent me this set of three messages. Funny thing is that I never received and APN settings. The was nothing to save, no where to enter this PIN, and my APN settings didn’t change. Now I think it would b great if you could just enter your phone number on the website and Tracfone would send your APN settings to your phone. The odd thing about this, other than not getting any settings, is that the web site never said anything about sending setting to my phone, it jut showed my my APN settings and the steps to enter them. Thought I’d share this with you.